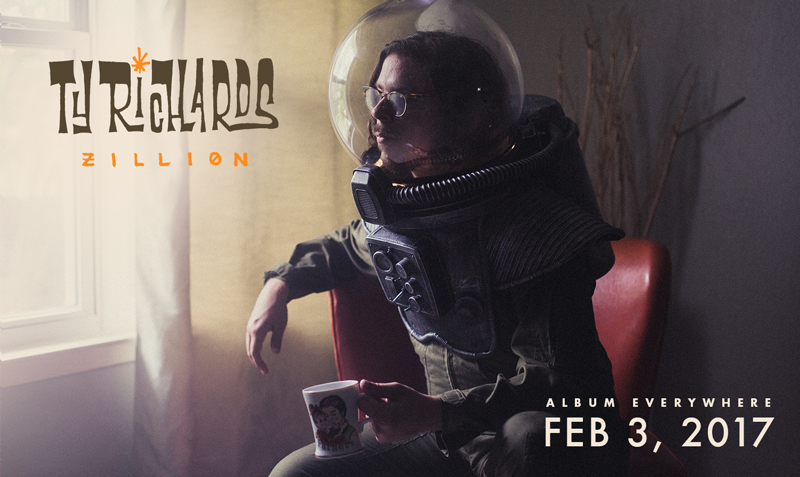 Austin’s genre-blending – although heavily psychedelic rock – musician Ty Richards recently announced that his debut EP Zillion will be released on February 3, 2017. It may seem like a zillion years from now, but 2017 is just around the corner. In celebration of this fun news, we’ve actually got the first single off that much-anticipated release, a song called “Spaceman”. Right off the bat, we must admit that the song gives us a throwback, hip swerving feel. Ty’s high pitched vocals are smooth – almost seductive – while the whirring chords dancing gracefully over the steady beat of the drums. There are aspects that feel slightly interstellar, but almost like what the 70’s versions of us would assume the future would sound like, if that makes sense. Toward the end, it dissolves into transient house music before zoning out, making a lasting impression. Zillion is out February 3rd. Keep up with Ty Richards here.